Anchor changes are afoot at CNBC. 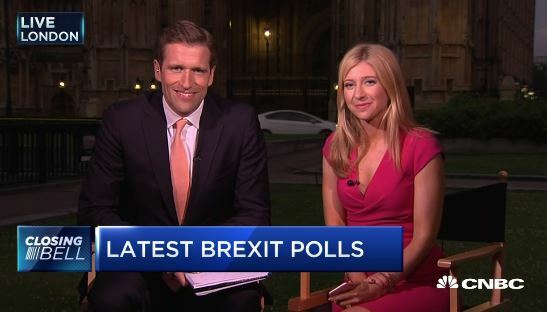 Wilfred Frost, son of legendary British TV host and journalist David Frost, who currently co-anchors Worldwide Exchange, is moving to Closing Bell alongside Kelly Evans. Frost’s Worldwide Exchange co-anchor Sara Eisen moves to Power Lunch, alongside Michelle Caruso-Cabrera, Melissa Lee and Tyler Mathisen. Eisen will also continue to anchor the 10 a.m. hour of Squawk on the Street. Brian Sullivan will take over the anchor spot at Worldwide Exchange, which airs globally, beginning at 5 a.m. ET, 11 a.m. in Central Europe and 6 p.m. in Hong Kong and Singapore. Sullivan will also serve as senior national correspondent. “This new role will give us further flexibility to deploy Brian and tap into his on-the-ground reporting capabilities,” writes CNBC svp Nik Deogun in a note to staff, obtained by TVNewser. Mathisen is also adding to his responsibility as vp of Event Strategy as CNBC looks to produce 20 in-person events this year. It also mean he’ll be moving off Nightly Business Report. Joining Sue Herera on the CNBC-owned PBS program is her former Power Lunch partner Bill Griffeth. “With Sue and Bill at the helm, NBR will continue to be positioned for success,” writes Deogun. Since CNBC began producing the show 5 years ago, NBR is up 20 percent in viewership, according to Nielsen Live +SD Metered Market data. The changes take effect next week.